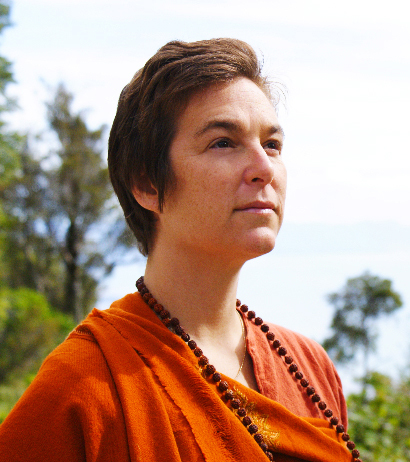 A founding member and director of Anahata Yoga Retreat, New Zealand, Swami Karma Karuna is also a dedicated, intuitive yoga teacher who has had years of experience working with a wide range of people. She specialises in women’s health, and by blending yogic lifestyle and Sannyasa tradition with motherhood, she brings a unique and practical approach to the practice of yoga, inspiring the integration of yogic principles into everyday activities. She also travels internationally part of the year, and has been involved in workshops, retreats, and teacher trainings, and in 2007 released her first yoga and meditation CD called Yoga Solutions for Life™ – Essential Daily and Deepening Practices. She is currently working on her new CD – Yoga for Women, which is due to be released soon. 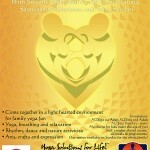 Join Swamis Karma Karuna and Muktidharma for an inspiring discourse and heart-opening mantra chanting! Experience the powerful effects of Satsang and Kirtan, both an integral part of Bhakti Yoga, the yoga of the heart and emotions, which is considered the yoga of the 21st century. 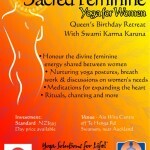 8th – 10th March 2013; Waihoanga Lodge, Otaki, Yoga and Sacred Feminine. During this sacred and powerful weekend we share from the heart, shedding light into the spaces that are often hidden and pushed aside in the hustle and bustle of daily life. Exploring music, dance, yoga and creativity to expand, liberate and unite. Feel the force of an all women’s gathering, the energy behind creation and existence. Join us in this safe and supported space, opening to transformation, surrendering to the moment and igniting the spark of inspiration. Claim your power and connect with your inner Self! Join us in this safe and supported environment to share from the heart and nourish the soul. 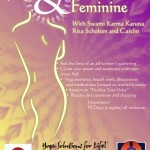 Experience the power of an all women’s gathering and open yourself to the nurturing and compassionate feminine energies.